An FIR was lodged against RJD President Lalu Prasad on 29 September for allegedly making casteist remarks as the Election Commission prima facie found them violative of the model of conduct for assembly elections in Bihar. 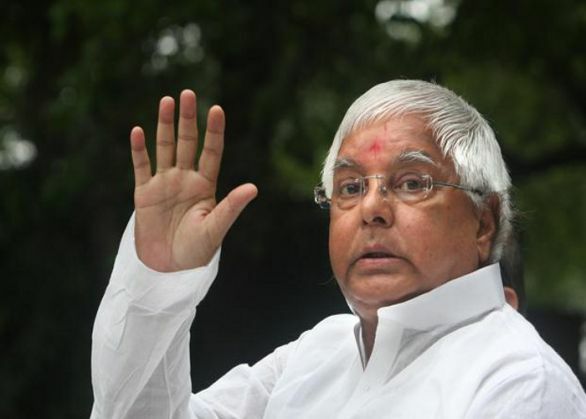 The FIR was registered with Ganga bridge police station in Vaishali district against Lalu Prasad by Circle Officer Raghopur Neeranjan Kumar in connection with his casteist remark, SP, Vaishali district, Rakesh Kumar said. The Circle Officer, who was deputed as magistrate during the election meeting of the RJD chief on 27 September last for his son Tejaswi Yadav in Raghopur, was ordered by District Magistrate of Vaishali Rachna Patil to get a case registered in the matter. Launching his campaign from Raghopur, the RJD supremo had described the assembly elections as a direct fight between "the backward castes and forward castes" and gave a call to Yadavs and other backward castes to rally behind the secular alliance to defeat BJP-led NDA. Additional Chief Election Officer R Lakshamanan said that the case was registered against the RJD chief on the basis of video footage of his utterances at a political meeting in Raghopur on 27 September. The video footage showed violation of model code and provision of Representation of Peoples Act hence a case has been registered, Lakshamanan said. Chief Election Commissioner Nasim Zaidi had on 29 September said that any casteist remark was a breach of EC guidelines and the Commission would deal with such matters under its legal framework. He had also said the Election Commission would find out the details of the alleged casteist remarks by Prasad and take appropriate action.